Since his election, President Donald Trump has made no secret of his plan to diminish the federal government’s role in public education, a big-ticket item for conservative reformers who balked at Obama-era education initiatives like Common Core. That’s why it came as little surprise last month when the president proposed a merger between the federal education agency and the U.S. Department of Labor. To explain Trump’s proposal, which has the support of U.S. Education Secretary Betsy DeVos, the nonprofit Brookings Institution offered some good background Monday on what’s come before for the Department of Education and what’s likely to come next. Republicans have opposed the Department of Education’s existence since its establishment in 1979. Recently, Republican voters’ backlash against the Common Core State Standards has reignited the Republican Party’s efforts to reduce the federal government’s role in education. In the 2016 presidential election, then-candidate Trump campaigned to terminate Common Core and the Department of Education to restore local control in education. Even though this proposal is unlikely to become law, Trump is motivated to demote the Department of Education in order to advance his campaign promises and engage in “position taking” with Republican voters on a salient policy issue before the midterm election this November. In October 1979, President Carter signed the Department of Education Reorganization Act, which established the Department of Education as a separate, Cabinet-level agency. Republicans opposed the enactment of this law because of their opposition to the federal government’s role in education and, generally, the growth of the federal government. President Reagan and Republican legislators introduced legislation to re-merge or abolish the Department of Education with no success. Over time, Democratic and Republican administrations, especially the George W. Bush administration, expanded the Department of Education’s influence in education. During the Obama administration, the federal government’s role in education re-emerged as a salient policy issue for Republican voters because of their strong disapproval of Common Core. Common Core is a set of K-12 education standards that 45 state governments initially implemented in 2010 and 2011. Americans, especially Republicans, increasingly opposed Common Core because its curriculum standards constrained teachers, frustrated parents, and exemplified—in their view—the Obama administration’s overreach into local education. Based on Education Next’s annual poll in 2016, Republicans (53 percent) somewhat or strongly disapproved of Common Core to a greater extent than Democrats (32 percent). Interestingly, only 34 percent of Republicans somewhat or strongly disapproved of the academic standards when the term “Common Core” wasn’t included in the description of the policy issue. Although state governments adopted Common Core, Republican legislators in Congress introduced and enacted legislation to prohibit the Department of Education from incentivizing state governments to adopt Common Core. From the beginning of the Obama administration in the 2009-10 congressional session, there were no introduced or amended bills that explicitly proposed to prohibit the federal government’s advocacy for Common Core in the 2009-10 or 2011-12 sessions, three bills in the 2013-14 session (H.R. 5, H.R. 4008, S. 2967), and six bills in the 2015-16 session (H.R.5, H.R. 524, H.R. 2803, S.73, S. 1177, S. Con. Res. 11). In December 2015, President Obama signed the Every Student Succeeds Act, which, in part, prohibits a federal government employee or officer from influencing, incentivizing, or coercing state governments to adopt the Common Core or other multi-state K-12 academic standards. Over the same time period, Republican lawmakers introduced legislation to abolish or entirely defund the Department of Education. There were no introduced or amended bills that proposed to abolish or entirely defund the Department of Education in the 2009-10 session, one bill in the 2011-12 session (S. 162), one bill in the 2013-14 session (H.R. 5394), three bills in the 2015-16 session (H.R. 1950, H.R. 2281, H.R. 6119), and two bills in the 2017-18 session (H.R. 899, H.R. 1510). By the end of President Obama’s second term, the Republican Party was clearly frustrated with the extent of the Department of Education’s reach and the Obama administration’s support of Common Core. In this context, this policy issue became a litmus test for the 2016 Republican presidential candidates during the primary election in summer and fall 2015. Republican candidates positioned themselves on Common Core to signal not only their position against the federal government’s overreach in education, but also their position for reducing the size of the federal government. During the primary election, then-candidate Trump advocated on Twitter to repeal Common Core (although this is not something the federal government had control over, then or now) and eliminate the Department of Education to reduce the federal government’s role in education. During the general election, candidate Trump pledged in his Contract with the American Voter to “end” Common Core and restore local control in education. 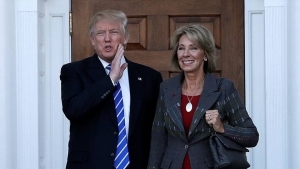 In order for Trump to successfully merge the two departments, it is necessary to enact a new law amending the original Department of Education Reorganization Act. To enact such a law, Trump will need a majority of votes in the House of Representatives and 60 votes in the Senate. (In the standard lawmaking process, 60 votes are required in the Senate to overcome a filibuster. If Republicans choose to amend the act through the budget reconciliation process, only a majority of votes in the Senate is necessary.) In the current session, there are only 51 Republicans in the Senate. The response of the National Education Association (NEA), the largest teacher’s union in the country, is a reliable indicator of Democratic support for education-related legislation. In contrast to their ambivalence on Common Core, the NEA’s strong dismissal of this proposal suggests that Democrats in the Senate are unlikely to vote for the proposal. Given the insufficient number of Republican votes in the Senate, this proposal is unlikely to become law in the current congressional session. Why, then, would President Trump propose this merger in the first place? The most likely answer is that the proposed merger is a case of “position taking,” an elected official’s public declaration for or against a salient policy issue to demonstrate policy congruence between the incumbent and her voters. According to political scientists David Mayhew and Phillip Edward Jones, voters are more likely to reward incumbents for the positions they take on policy issues, rather than the enactment of a policy or a policy’s outcomes. Thus, proposing a merger that is unlikely to happen may still be valuable for Trump and the Republican Party during a midterm election year; this position is consistent with Republican voters’ preference for a smaller federal government in general, and a smaller role for the Department of Education in particular. Regardless of whether this proposal becomes law, Trump’s introduction of this plan may help increase his approval rating among his Republican base, mobilize Republican voters in the upcoming midterm election, and increase the likelihood the Republican Party will retain majority control of Congress.